HEBER SPRINGS, Ark. 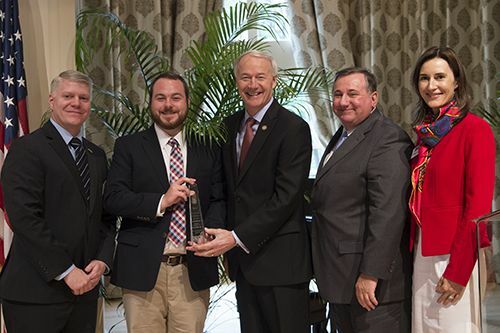 - June 12, 2017 - PRLog -- On Wednesday, May 24, Garreco, LLC was recognized with the Governor's Award for Excellence in Global Trade by Arkansas Governor Asa Hutchinson and the Arkansas District Export Council (ArDEC). The 8th annual awards luncheon held at the Governor's Mansion in Little Rock, recognized exporting excellence among Arkansas' manufacturers and service providers. Garreco is the only manufacturer of dental gypsum in the state of Arkansas and has been in business since 1988. The company manufactures a complete line of ADA/ISO Standard dental gypsums and plasters used by dentists and laboratory technicians for model making and casting to create dental restorations in the mouth. Garreco also offers a full line of abrasives, dental acrylics, silicones, and dental laboratory supplies at their facility in Heber Springs. "Trade is vitally important for Arkansas. Increasing exports of Arkansas‐made and Arkansas‐grown products results in two excellent outcomes. It produces extra capital for companies to invest in their facilities and creates new employment opportunities for Arkansans," said Governor Hutchinson. Garreco is focused on creating new export initiatives and has plans to continue to increase its efforts in global trade. During his acceptance speech, Garreco CEO, Bob O'Neal, commented that, "Continued growth is vital to the welfare of any organization, as well as its employees and shareholders, so we see significant opportunities in a more focused and sustainable global trade effort." The Arkansas Governor's Awards for Excellence in Global Trade is designed to publicly recognize Arkansas companies and their employees who contribute to the economy through international trade. Garreco is one of the leading United States manufacturers of dental gypsum and has been providing quality dental laboratory products for over 28 years. In addition to its dental offerings, Garreco produces products for the industries of aerospace, jewelry casting, forensics, taxidermy, special effects, and hobby. Not only does Garreco provide a wide range of quality products under their own brand but they also manufacture private‐labeled products and offer custom formulation, color, set times, and packaging. To learn more about the company, please visit Garreco.com.